Do Air Plants Need Sunlight? Yes! Some people wonder: Do air plants need sun? The answer is Yes! They do! It’s important to know the right-light sweet spot is for your air plants. The short answer is bright, indirect light. Of course, that answer can be fine tuned. 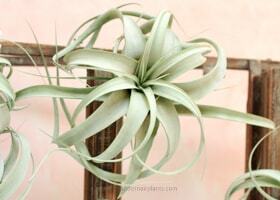 I’m sure you have noticed the silvery sheen or whitish fuzz on your air plants. Sometimes it is more visible on the underside of the leaf. On some air plants the sheen is highly visible, on others, not so much. The silvery sheen or fuzz has a name: trichomes. Trichomes serve many purposes. Like a sponge they absorb water for the air plant. 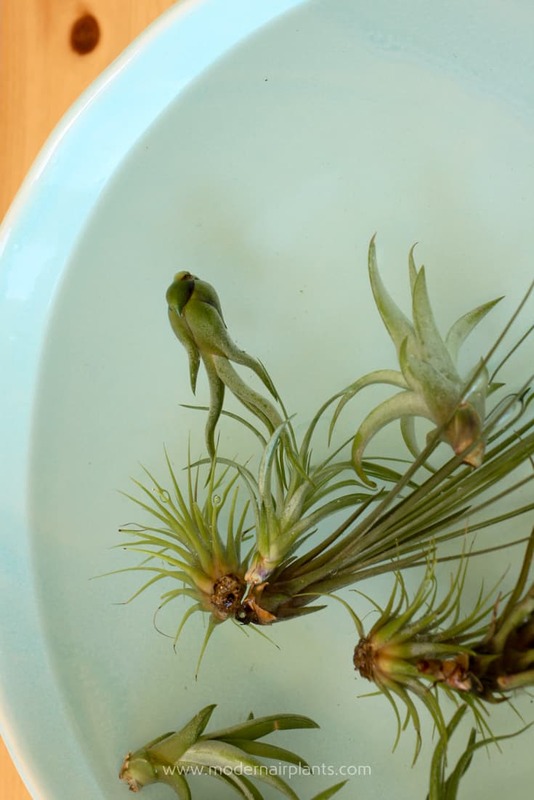 That’s why soaking is the best way to water air plants. Soaking gives the trichomes time to reach maximum water capacity. But, trichomes are more than sponges. Soaking your air plants in gives the trichomes a chance to absorb water and prevents dehydration. Trichomes are serve as sun shields protecting the leaves from intense sunlight. The more trichomes an air plant has the more sun they can handle. Give the more silvery air plants the most very most light possible. Keep in mind that because our homes are so much darker than the outdoors, give your air plants the best indirect light that your home has to offer. Perched atop a bit of driftwood, this Tillandsia aeranthos basks in bright, indirect light. Although the trichomes are difficult to see, be assured that they are there. You may be thinking: I know my side table is dark, but that is exactly where I want to place my air plant display. My answer is: Go right ahead and put your air plants wherever you want. This may mean that your plants won’t last as long as they would have in a more sunny location. But there is an alternative. Play musical air plants. 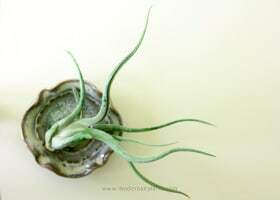 Watering day is the perfect time to take the air plants from their less than ideal locations and place them in the very best light location your home has to offer. 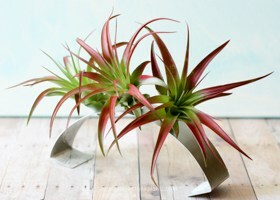 Then take the air plants from their ideal location and place them on your side table. Or, wherever makes you happy to see them. Just remember that a weekend stay in prime light is not enough to compensate for primary residence on the dark bookcase. Because my home has wide eaves, I know my air plants will never get enough light hanging out in my living room. By playing musical air plants they can take a short turn in the less than optimal lighting without any long-term harm as long as I don’t let them sit there for too many days before returning them bright, indirect light. Remember when I said that indirect light is ideal for your air plants? Now I am going to modify that advice. A bit of direct light can actually be beneficial and can bring out more color in your plants. That said, watch for sunburn on the plant’s leaves and make sure they are adequately hydrated and ventilated. Weather permitting,cracking a window will add more air circulation for your air plants. Pull up your blinds, throw open your curtains and let in the sunshine! Thanks for your great wisdom in raising air plants. I’m learning so much. Thanks so much! I appreciate your comment! My three little plants came in the mail, I noticed several brittle leaves looked like it had been snapped. Will they die? Or be more damaged? Or will they still thrive under proper care and loving? 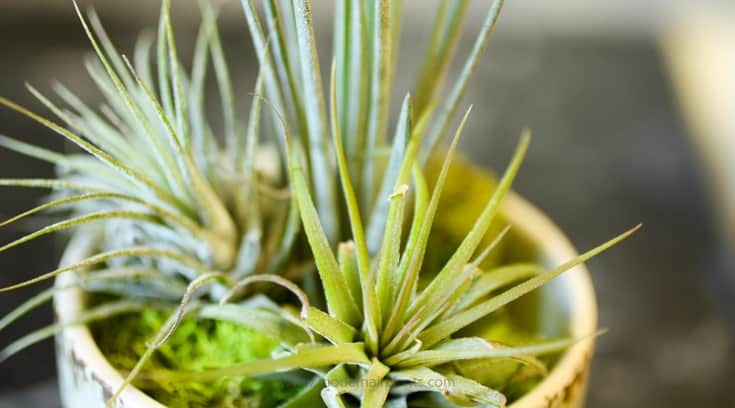 Air plants can look a little haggard after being mailed, but usually, they have been well cared for and will bounce back. Let the seller know how the air plants looked upon receipt, then wait and see if they recover. Hi Anna…loving your advice thank you. I’m learning a lot from you. I have lots of Air Plants and adore them….Some do better than other, so your advice will help me get them all sorted out. Thank you so much! Air plants are hidden gems among the plant world. It is a joy to share what I learn about them with you! One of your answers above mentioned not putting the dome on a terrarium. I just purchased an air plant for a terrarium to pair with some moss and rocks. I have the dome on currently. My thinking is that the air plant might like the moisture…guess I need to find a new home for it? You could always replace the air plant if it doesn’t do well in the terrarium. 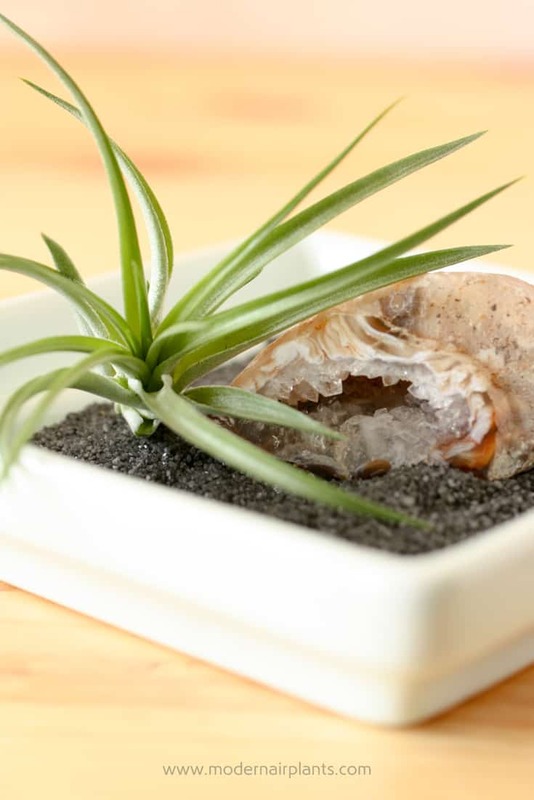 Good air circulation will definitely prolong the life of your air plant, but if you really like the look of the terrarium, just plant on eventually replacing the air plant. Thank you for the great tips. I’m wondering if there is a tell tale sign that the air plants aren’t receiving enough light? Great question! Thanks for asking. To determine if an air plant needs more light, look for overall fading and/or faded spots. 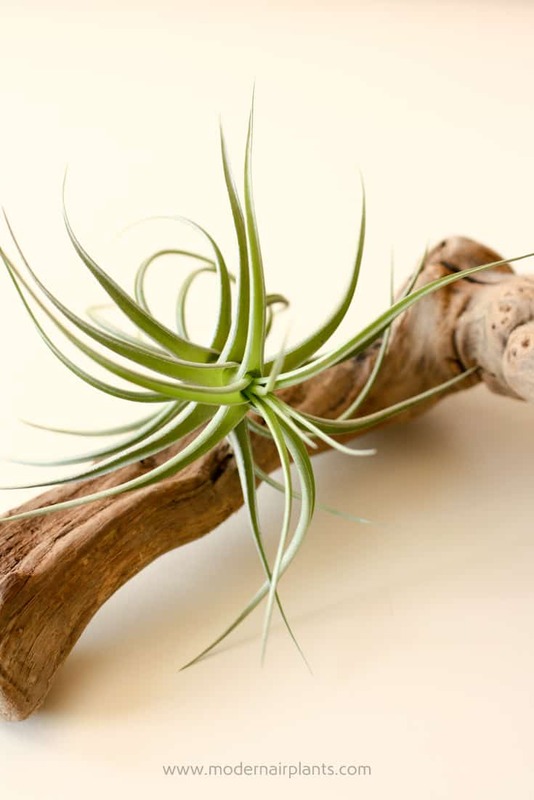 Air plants with insufficient light may appear healthy and then suddenly fall apart in water, as lack of light will lead the air plant incapable of absorbing both light and water. I have my air plants under grow lights for the winter and all are a few inches away from the lights themselves, but I’ve noticed that some of them besides my Caput Medusae and Xerographica have begun to get brown leaf tips in spite of misting twice a day. Any advice? It’s a good idea to keep the lights about 12 inches above the air plants. Air also tends to be a bit drier in the winter. If you have a humidifier, your air plants would appreciate the added humidity during the winter months if you live in a dry climate, or if you have a furnace going. Thank you for sharing your great tips. Really making me understand about my air. My air plants have never produced flowers? First, give your air plants more light. It takes a lot of energy (in the form of light) for them to produce flowers. 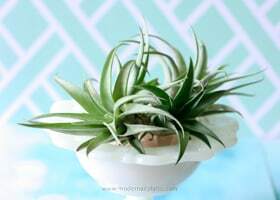 Second, fertilize your air plants, but do so sparingly. The bad news is that air plants bloom only once, so if your air plant bloomed before you got it, you’re out of luck. 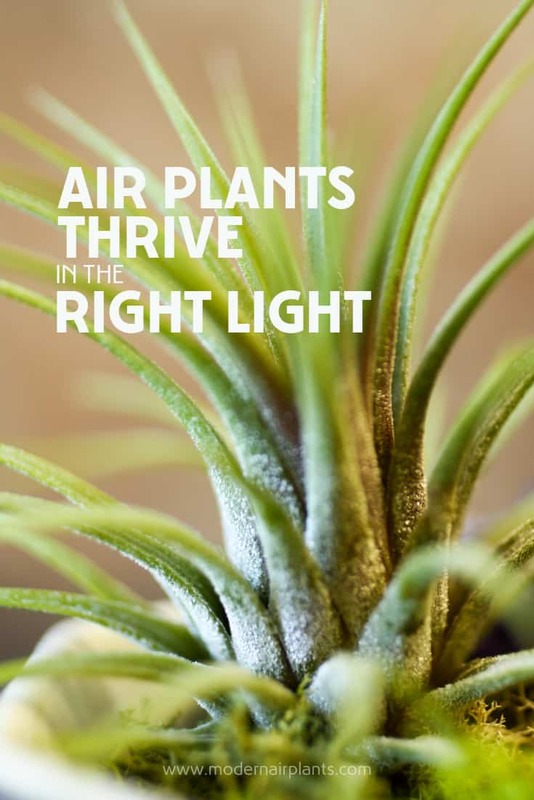 My first course of action would be to give your air plants more light – be patient. Ooooh! Sounds beautiful. My only tips would be to dry the air plants thoroughly after watering before returning to the terrarium and to not add a lid to the terrarium for optimum air flow. These tips are great. I’m learning all about the reasons my previous air plants have not had a very long life. And will try no to make those mistakes again. Will a grow light i have on my fish tank, also be beneficial for my air plants, if i set them under the lamp for an hour every day? I live in a cold climate, and do plan to move them to the kitchen window but there is a bit of a draft there in the winter months and will worry they will get cold there. Thank you for your kind words. I haven’t grown air plants under lights I would love to hear how it goes. I have orchids under lights that do very well – but my air plants are doing great without artificial lights. PLEASE, let me know how it goes. Great article! My new addiction. Thank you! The great part about an air plant addiction is that it’s a healthy addiction. Think how clean your air is with all those air plants! Hi Anna, Thanks for all tips and advice. Since I accidentally deleted tip #3, I am kindly asking you to resend it please if that is possible. Thanks much. Check your inbox. I just sent you tip #3. Let me know if you didn’t get it. I’m glad you’re enjoying the tips! I’ve had my airplants for a couple years now with no deaths yet. I keep them in the front of a window that gets full evening sun. They do great but no offshoots yet, that’s my #1 wish. I soak them once a week. Love reading your article! Congratulations on your air plants! That is kind of puzzling that your air plants haven’t produced any pups. Watch for your plants to change color- become more red or orange, starting in the center. That is a signal that they are about to bloom–and produce a pup for you. I really want you to get some air plant babies! Thanks Ana … I am fascinated with the discovery of the world of air plants and think that I had them nearby, additional complement with the decoration……In my city (Quito) there is only one variety … I plan to travel around the country to find more varieties. What an exciting journey of discovery lies ahead for your! I’m jealous! Thank you Sandra! I am glad you found my site helpful. Please, let me know if you have any questions about air plants that I can answer! Can Air Plants survive being outside? Yes they can. Keep your air plants above 40-50 degrees F and water frequently and provide some shade if temperatures reach above 100 degrees F.
Have fun growing air plants outdoors! I have been going over your steps on Air plants and I have to say looking at so many “Growers” sites and listening to their advice etc.. I get confuse! Your steps however, are very easy to understand and very helpful. I have been taking notes and feel confident in giving my presentation next week.. THANK YOU so much.. Thank you Caroline. I am so glad that you find my information helpful and easy to understand! You’ll do great on your presentation! Thanks for the great advice. Now I know how to show off my air plants and also keep than happy and healthy!